The families of the Israeli civilians held by Hamas in Gaza, Avera Mengistu and Hisham al-Sayedd, hold a joint press conference for the first time in front of at the offices of the International Press Club in Jerusalem Thursday. 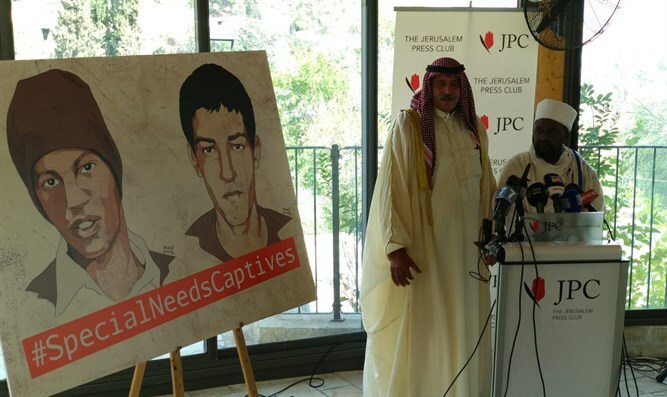 The press conference was held following the publication of the IDF's assessment that the two captives are still alive. The families demanded the immediate release of the the captives and called for the treatment of prisoners with special needs not to be influenced by political considerations. Al-Sayed and Mengitsu both suffer from mental illnesses and have a long history of hospitalization in psychiatric hospitals. The two accidentally crossed the border into the Gaza Strip in separate instances and were captured by terrorists in the Hamas-controlled enclave. lan Mengistu, the brother of Avera, said at the press conference: "A person with special needs is being held as a hostage. This is cruelty. Ours is a human tragedy that crosses borders, and Hamas is on the spot to release him immediately, as required by international law. I turn from here to the leader of Hamas: Be human beings and free my brother. The decision is up to you. A four-year-long tale of suffering can come to an end and Avera ​​will receive medical treatment. "I turn here to the UN Human Rights Council," he continued, give us back our dear brother, Dear Avera, if you can hear me, be strong. Not a day where we do not think about how to get you back." Hisham al-Sayed's father said at the press conference: "My son is mentally ill and crossed the border by accident. Hamas is using my son as a bargaining chip. It makes no sense. I turn to Hamas: Come to your senses. My heart is with the Palestinian people. and I appeal to the Palestinian people in Gaza and elsewhere that Hamas acts does not act in our interests. We must return to the previous situation and we will all live in peace." After the press conference, an interfaith prayer service will be held, led by the Kes (Ethiopian religious leader) and Imam of the prisoners.